For the past two weeks the United States Women’s National Team has been training and competing in the Algarve region of Portugal for the 2015 Algarve Cup. The yearly event which the USWNT has competed in 20 times (including this year) since its start in 1994 (22 years) provides solid competition against some of the world’s best teams. This year is no different as 9 out of the 12 teams competing have qualified for the 2015 Women’s World Cup (Brazil, China PR, France, Germany, Japan, Norway, Sweden, Switzerland, and the United States) and 6 out of those 9 teams are ranked in the FIFA Top 10 Women’s rankings (Brazil, France, Germany, Japan, Sweden, and the United States). This tournament is one of the last true tests for the USWNT before the World Cup begins in June as only 4 friendlies will remain after the competition finishes (3 of the friendlies are against teams competing in the World Cup). I’ve been following the tournament pretty closely. So I’m warning you in advance, this is an in depth look at the 3 group matches. Each game is sectioned off in bold. The competition began last Wednesday, March 4th as the U.S. squared off against Norway. The match ended in a 2-1 victory for the red, white, and blue with both goals coming from the feet of midfielder Carli Lloyd. The USWNT went down 1-0 late in the first half with a goal from Norway’s Ada Hegerberg. Lloyd’s first tally came in the 55th minute when she ripped a left footed shot from 18 yards out. The second goal came less than 10 minutes later in the 62nd minute when a Christen Press shot hit a Norway defender’s right arm leading to a hand ball call. Lloyd took the ensuing PK and placed the ball into the top right corner for the go-ahead goal. Some key things I took from this match were firstly the USWNT debuted their brand new 2015 away kits. The kits were fire. From what I’ve read it seemed like many people were not fans of the new kits initially but I liked them from the first time I saw them back in January where an image was released to the internet prior to the official announcement. I’m not sure if the consensus changed after the debut last week, but I have to say I’m still a huge fan nonetheless. The striped blue fade jerseys with the white stripe down each side looked awesome with the navy with white side stripe shorts. I included a picture at the bottom of this post so you can judge for yourself. Secondly, Hope Solo made her first start in goal since receiving her 30 day suspension for matters that happened during the January camp. She looked a bit shaky in this match at times, but still ended up with a key save in the 54th minute. As much as I love back-up goalkeeper Ashlyn Harris, I feel like this team is incomplete without Solo. In the wake of her suspension there was talk that she might not be allowed to play in the World Cup. Fortunately that looks like it won’t be the case. Sure she needs to be more disciplined outside of soccer and I’m sure she knows that especially in a World Cup year, but regardless, she’s the best goalkeeper in the world. For the U.S. to have a chance at a World Cup title she needs to be in net this summer. It’s as simple as that so I was glad to see her back. Thirdly, it seemed like the U.S. had trouble finishing their chances. This has actually been a recurring theme as of lately for the team. They needed to be better in the attacking third. It seemed like when they did have chances, the majority came from the attack on the right side of the field in thanks primarily to the work of Carli Lloyd, Ali Krieger, and Christen Press. That may have had something to do with what the lineup looked like for Wednesday’s game (because Friday’s match had more attack from the left). Lastly, I wanted to touch on some players who I thought were key in the game Wednesday as I mentioned above, Carli Lloyd, Ali Krieger, and Christen Press. Carli Lloyd who scored both goals and was named Woman of the Match was an absolute beast on Wednesday. She’s a special player. She’s got a rocket of a shot that she can easily use to score from outside the 18 (we saw it Wednesday). She’s a tireless worker on the pitch. She’s a leader for the team and most importantly she seems to raise her game when the team needs it most. She was playing on Wednesday with a noticeable black eye that she apparently received in training and it made her look like an absolute bruiser, which works since she plays a very physical style of soccer. She’s a key piece for this team to be successful at the Women’s World Cup. They’ll need her to be on top of her game and on the pitch as much as possible this summer so hopefully she’ll be up for the challenge. With a mentality like Carli’s though, I have no doubt she will. Ali Krieger, one of the most underrated players on the USWNT and in my opinion the best right back in the women’s game, was stellar during Wednesday’s match. She played a full 90 and constantly made runs up and down the right side of the field. She joined the attack trying to create scoring chances by sending crosses in from the right. She also got back/sprinted back at times to defend the opposing attack. She did this with ease while also stopping chances from developing and making some important defensive plays. In the opening minutes of the game, she single handedly made one of the key saves of the game when Solo, dealing with some traffic, was unable to get her hands on a cross that came into the box and landed at the feet of a Norway attacker. With Solo off her line, Krieger stepped up and blocked a shot that was surely headed for the back of the net. What was even more incredible in that moment was Krieger’s quick decision to get her arm tucked into her body against her chest. Had her arm/hand been in the air or not against her body the U.S. may have been called for a hand ball in the box. It was an incredible effort by the defender. Like Carli Lloyd, Ali Krieger is another key piece for the USWNT and once again to be successful this summer they’ll need her. There should be no questions about who the right back will be for the starting XI in June because Ali Krieger is nothing but world class. Christen Press played a key role for the team vs. Norway as well. She looked dynamic out on the pitch creating chances for the team. Her first touch was a thing of beauty. She had a shot go off the post and another that just went wide of the net in the first half. It seemed that there was chemistry developing on the right side between her, Lloyd, and Krieger. From watching Christen Press in the last two years though, the thing I’ve noticed is that at times she can be inconsistent. Her game seemed to drop off a bit in moments where as a forward her team really needed her to step up and score. For example, last year in the UEFA Women’s Champions League Final her play was lacking and she wasn’t the one to step up when her team needed her most. Sure everyone has bad games but to me the best players in any sport are the ones who find a way to win. That’s something I’ve noticed has been missing from Press’ game. Can that change? Sure. There’s no doubt she is a fantastic player and has the ability to change it too, but it will be interesting to see whether or not it will happen come June and what role she will play in the USWNT’s World Cup run. I’m hoping for the best for her and that she rises to the occasion. 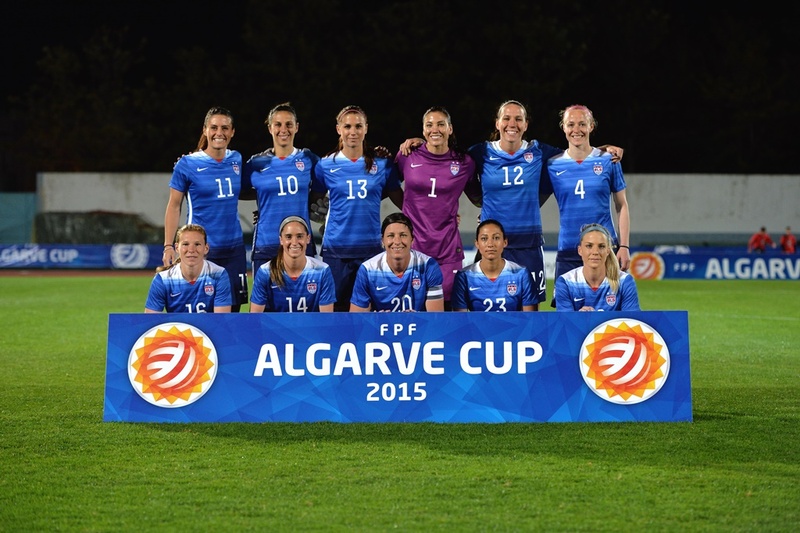 The second match of group play for the USWNT in the 2015 Algarve Cup came on Friday, March 6th against Switzerland. Once again the U.S. persevered as they cruised to a 3-0 victory leaving them one win away from a spot in the Algarve Cup final. Their first tally came at the 54 minute mark of the second half when forward Alex Morgan directed a Lauren Holiday free-kick into the back of the net. The second goal happened when Amy Rodriguez collected a rebound, turned, and chipped a shot past opposing goalkeeper , Stenia Michel in the 72nd minute. The final goal that allowed the team to get the 3-0 shutout win came when Abby Wambach took advantage of a poor back pass by Switzerland and shot the ball over the head of Michel and into the back of the net. Her goal came in the 81st minute. Of note, Hope Solo had a huge save off a Laura Dickenmann strike in the 60th minute that could have changed the U.S. surge in momentum in Switzerland’s favor. Important notes from Game 2 are as follows: The team still looked to be having trouble with that final pass/finishing effort, especially early on, but looked a little better with it than on Wednesday. Also different from Wednesday was that in the first half in particular the attack was generated from the left side through the work of Alex Morgan, Megan Rapinoe, and Meghan Klingenberg. They created a number of opportunities for the team early. Klingenberg looked very good at the left back spot, a position occupied by Lori Chalupny in the Norway match until Klingenberg subbed for her at the start of the second half. Klingenberg played a full 90 on Friday and it seems like she’s been making a strong case to be that starting left back for the World Cup. Although, there might be some other reasoning as well which I’ll touch on in the future. It was Megan Rapinoe’s first game back (other than playing for a couple minutes on Wednesday at the very end) after injuring her knee during the January camp. She’s also a pretty special player and she plays in such a way that mirrors her personality. She’s crafty, creative, and clutch. With her you never know what you’re gonna get whether it be on the pitch or just in general. Because of that, there’s been questions about her consistency on the field, but to me it seems like she always comes out to play in the big games. She’s another important piece to the puzzle for the USWNT and I’m hoping to see her in a prominent role for the World Cup. I mean let’s be honest (or should I say lesbehonest?) without that cross from Pinoe, Abby doesn’t tie the game in the 123rd minute of extra time to send the 2011 quarterfinal to PK’s. She’s clutch. Alex Morgan, the face of U.S. soccer, who is actually more than just a face demonstrated why that’s the case in this match as she has done time and time again in the past. After playing a relatively quiet first half, she scored the opening goal 9 minutes into the second. That’s the thing about Alex Morgan. She always finds a way. She’s always dangerous, even when she doesn’t get too many touches on the ball. When she does get touches though, she creates opportunities for herself or her teammates to score. In the last two years she hasn’t played as much as she could because of ankle injuries that left her sidelined for months. Even now as she makes her way back from a second ankle injury that kept her out of part of the CONCACAF qualifiers until the matches overseas against France and England, she’s still a threat. She’ll be a main focus this summer for many reasons, but her level of play should be the reason at the top of the list. If the United States does come out on top, she’s sure to be part of the reason. Like Rapinoe, she’s also clutch. But more importantly, she’s one of the best in the game. Finally, the last thing I took from Friday’s match vs. Switzerland was that around the 65th minute mark Switzerland’s play seemed to drop off, an indication that at this point they’re not as fit to keep up with the USWNT. That being the case, the chances started coming together towards the end of the game for the American women. The last goal in particular was proof that Switzerland was tired. Once the World Cup comes around that will no longer be the case. So it left me wondering, would the outcome have been any different if that didn’t happen? From the past couple matches, I feel like it would. Maybe the U.S. would have still won, but maybe not. Hopefully it will change when June rolls around, but even at this point the USWNT have not reached their peak. Then again, I think everyone wants them to peak in June anyway. On Monday the USWNT took on Iceland in the final game of group play. With a win they would guarantee themselves a spot in the final against France. However that’s not exactly what went down, but they still got that spot in the final. The result of this match-up ended in a 0-0 draw giving the USWNT 7 points out of a possible 9. The 7 points were good enough to get them to the Algarve Cup final though. Unfortunately due to “lighting issues” the game was not broadcast in any form via the television or internet. I followed along on twitter, but it’s not comparable to watching the game so it’s difficult to recap my view on things. Of note, the lineup in the Monday’s game was a bit different than the lineups that played in the first two games. Ali Krieger, Carli Lloyd, Christen Press, Lauren Holiday, and Julie Johnston who all started the first two games were left out. Lloyd subbed in at the half, while Press and Holiday came in at the 60 minute mark. Krieger and Johnston were given the day off. Between all three matches the lineups were never the same though. The only constants through the tournament so far have been Hope Solo and Becky Sauerbrunn who have played the entirety of each game. Everyone besides defender Crystal Dunn, back-up keeper Ashlyn Harris, and defenders Christie Rampone and Whitney Engen, who were sidelined for injury issues, logged minutes. Some other things I noted from the game tweets was that the theme of the team not finishing their chances continued through this game as well and was evident by the scoreline. From what I read, it seemed like Iceland sat back, played a tight defense, and waited for counter opportunities similar to what Trinidad & Tobago did back in October during World Cup qualifying where the end result was a 1-0 U.S. victory. Even with the draw though, the U.S. will get a re-match from about a month ago with #3 FIFA ranked France for the title. They’ll play today at 12:00 p.m. ET and the match will be aired on Fox Sports 1 (this is actually the first time the Algarve Cup was broadcast on TV in the United States…pretty cool). We’ll see if the team has improved since their last battle with France that ended in a 2-0 France win. Hopefully they have and it’s an exciting match. I’ll update again tomorrow with a recap of the final and closing thoughts on the Algarve Cup as the USWNT heads into the final stretch of games before taking on Australia June 8th in their opening match at the 2015 Women’s World Cup. The starting XI debut the new away kits prior to the team’s opening match at the 2015 Algarve Cup on March 4th vs. Norway. Photo courtesy of U.S. Soccer.